Our new ISO 150 Disc rear hub brings the time-tested reliability and performance of Chris King hubs to downhill and heavy-duty freeride bikes featuring 150mm x 12mm thru axle rear dropouts. These big bikes get into some serious situations but it’s no concern for the ISO 150 Disc hub. 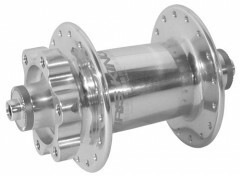 This isn’t a “new” hub, it’s another great hub from King. Same performance. Same durability. Same expectations. continue reading "Chris King ISO 150 Rear Disc Hub"
continue reading "Chris King ISO 20mm Thru Axle Disc Front Hub"
Chris King is not known to jump on the bandwagon of every new design that goes by. While the 24mm QR style hub attachment system is relatively new, we feel that it solves a variety of problems all at once. For some riding styles, the old “quick release skewer” type front hub is just not enough for the job. Along came the thru-axle front hub for bicycles. Thru-axles came to bicycles from motorcycling. They are very strong and it is a time-tested attachment system. Thru-axles work very well on bicycles too. It’s just a pain to get the wheel on and off to throw your bike in the back of your car. That’s where Maverick’s 24mm QR system is better, two little levers and off comes your front wheel. 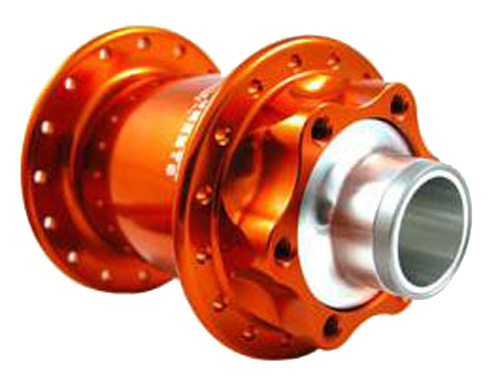 continue reading "Chris King ISO 24mm Front Disc Hub"
High precision disc hub for design fans! Months of design and testing went into Chris King’s ISO disc hub. During the development process, they adapted the machines to use larger bar stock when they make the hub shells. This manufacturing improvement allowed to increase the spoke flange diameter significantly. A larger spoke flange spreads the spoke holes away from each other. Also you can use shorter spokes to build a more durable, stiffer and stronger wheel. Ultra stiff 19.5 mm axle, multiple sealed high-end bearings. CNC-machined, anodized hub shell. Easy adjustment with hex tip screwdriver. 5 years warranty manufacturer warranty. continue reading "Chris King ISO Disc Hubs from Bike24.com"
continue reading "Chris King Classic Hubs from Bike24.com"